There are so many ways to connect metal components for jewelry making without the use of a torch. Learning these popular cold connection techniques such as wire wrapping, riveting, stamping and forging will definitely lead to the creation of unique designs. They aren't hard to learn and do but some will require some practice to be proficient. 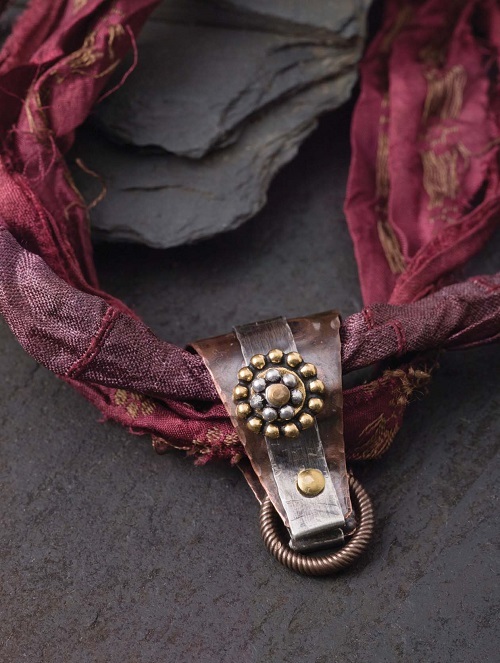 The latest book I received from Interweave for review really showcases how beautiful and outstanding jewelry can be. Exploring Metal Jewelry is by Tracy Stanley, who calls herself a "low-tech" metalworker. She said, "I prefer to rivet or wire my pieces - no flame (other than making amazing head pins) and no glues." Anyone who is leery of using the torch can certainly purchase balled head pins instead of making them. 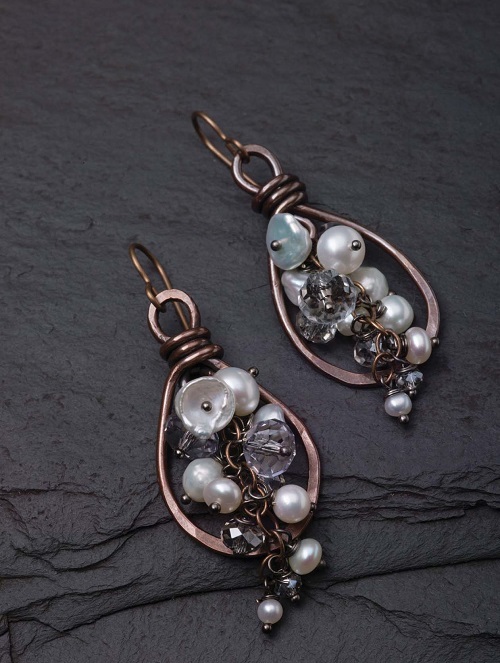 Her layered jewelry pieces with oodles of texture certainly inspire! The 18 design projects are all copper based. The dark patina not only add timeless elegance but also allow those whose skin tones do not usually go well with bright copper to wear these kind of designs. Just under half the book is devoted to tools and techniques, making it a suitable reference for beginners and intermediate metal workers. Many of the tools are basic ones. For instance, the author suggests just the basic hand wire coiling around any mandrel although you could use all kinds of tools to make the task quicker. She only covered the use of a jewelry saw or a tube holder for cutting copper tubes. Tube cutters (from the plumbing department) are much easier to use! I particularly liked her section on the use of common scrapbooking embossing plates for textures. Copper is a soft metal and will texture easily. Her ring designs were excellent examples of how you can make beautiful rings without having to anneal or solder. 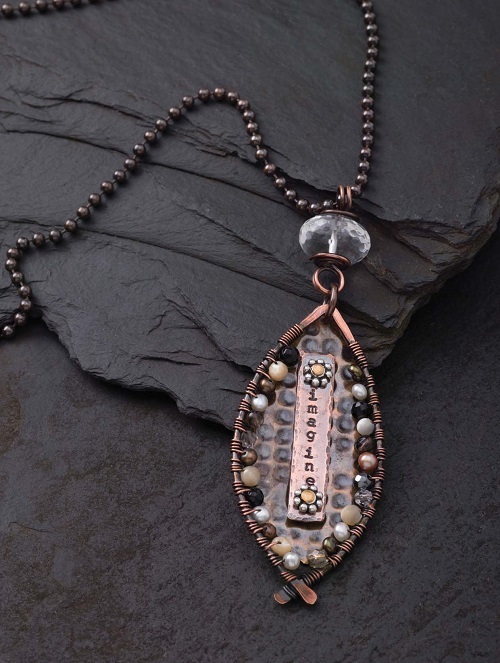 One of my favorite designs was her gorgeous Over the Top copper bail (shown below) which involves the riveting of textured copper strips with metal daisy rondelles. 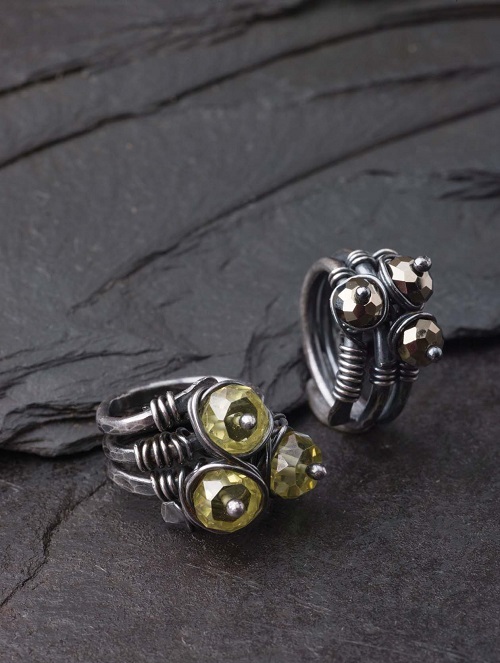 She also combines wire work with riveting in a number of designs - why stop at one connection technique? The book cover shows an amazing beach themed pendant design. 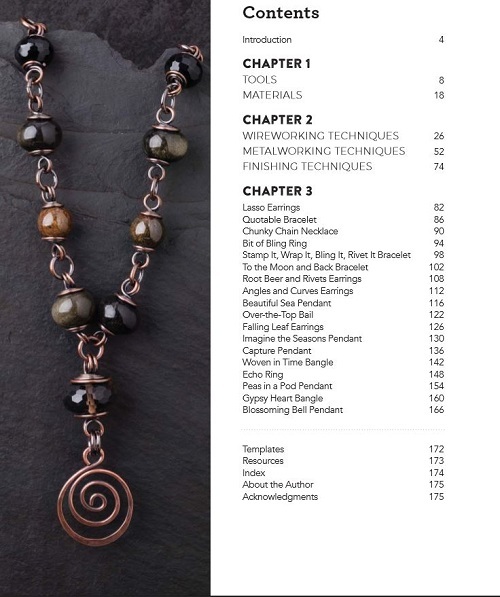 This outstanding and inspirational instructional book is not just for copper lovers! The author's clear and well illustrated instructions covers the techniques without being overwhelming. A good deal for learning several techniques in one book. 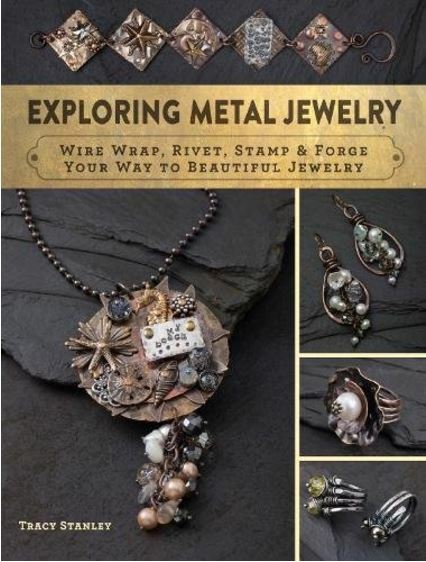 If you'd like to win this giveaway for a copy of Exploring Metal Jewelry, please make a comment below. Make sure you leave contact info below if you do not have an online shop or blog. It ends in a week's time at 6 pm EST Monday, August 14 , 2017. I will pick the winner randomly and announce the results as soon as possible after. So be sure to leave a contact email if you don't have an online link or make sure you come back and check! Otherwise I will redraw in a week. Good luck! I woule LOVE to win this book! I am a chicken when it comes to using a torch so this would help greatly, plus she's always got so many great ides already. Enter me to win please! This looks like such a cool book. I'd love to win a copy of this to check out all her work/tips/designs. Just tweeted about the book and giveaway. I want to learn all these techniques! Pick me! Love how these look!! I'm a blog follower subscriber and facebook fan, can be reached at retro-grrl@hotmail.com. Wow! I could learn so much from this book! I would love to learn about cold connections and no-special-tool methods to work with copper (metal)! The pictures above are so tempting to try! What a wonderful giveaway! I am a blog follower. Pearl thank you again for a wonderful opportunity to enter this drawing. I just bought a torch to start working with metal. I would love the chance to win this one and explore this dimension of wire and metal. Looks like a wonderful book!!! I would love to have it. I follower you everywhere!! lol I'm tweeting this also. I would love to be able to explore this book and try out new things!! Want to win it!! I just love the author's design style. Why? Because it matches my aesthetic. Wow! I love this book. Pearl, another home run of a giveaway opportunity. Thank you and the author. I do love working with copper! Just reading your review makes me want to race into my studio and get to work on something new! What a great book this would be to add to any collection of 'how-to's'! I firmly believe that it doesn't matter what level of expertise you have in any medium. You can always learn one thing new from even the easiest lesson. The inspiration alone is absolutely worth investing in this! Please enter me! I would love to learn more. Very intereted in thee designs. Would love the book. I keep seeing metal jewelry ides on Pinterest and would love to try making some pieces. This book looks like the perfect place to start. Please enter my name in the drawing and as always, thank you for the opportunity! This book looks fantastic! Thanks for the chance to win it. This looks like a must have book. Who wouldn't want a copy of this? Beautiful designs. celticartwitch@gmail.com. Exploring Metal Jewelry would be an invaluable addition to my library of instruction books on jewelry-making. Like the author, Tracy Stanley, I am also reluctant to use torches in my work . I live and work in a very old and probably very flammable house, circa 1900. Although I have taken courses in which soldering figured prominently, I avoid it at home. I started doing wirework and riveting a few years ago. I absolutely love it.I learned some of the essential from books and online tutorials. My work is a fusion of early Victorian Steampunk and mid 20th century whimsy. 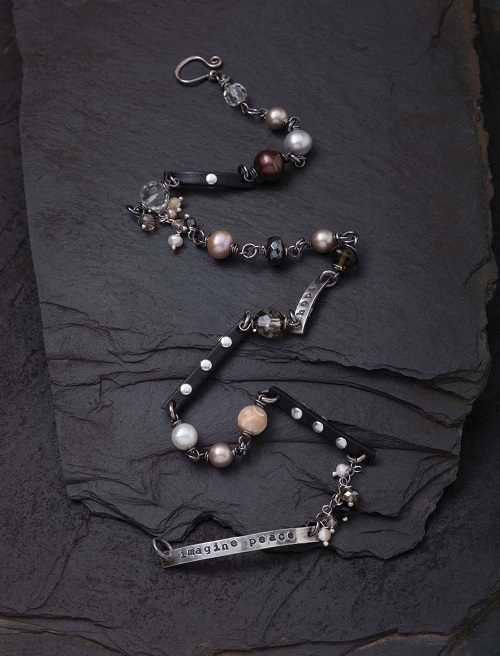 I utilize new and vintage natural brass, sterling, and gold vermeil findings, plus a variety of semiprecious gems, freshwater pearls, mother of pearl, vintage glass, leather, and Austrian crystal. I have been largely housebound due to illness the last few years. Your Journal has been an inspiration to me throughout this time. I am presently recovering from major surgery. Guess what? One of the first things that I did when I arrived home from hospital on Aug.4/17 was check your latest email posting. I am so enthused about your online posts on books, DIYs, designs, tips, supplies, and tools. Keep up the good work! I would be absolutely thrilled if I won "Examining Metal Jewelry"! So glad that you are now home and recovering from your surgery. Looks like you are ready to get back to creating jewelry! Looks like it has some fabulous ideas. I would love to try some of them. I love using different metals, but I really like to keep it basic - no torch or soldering. 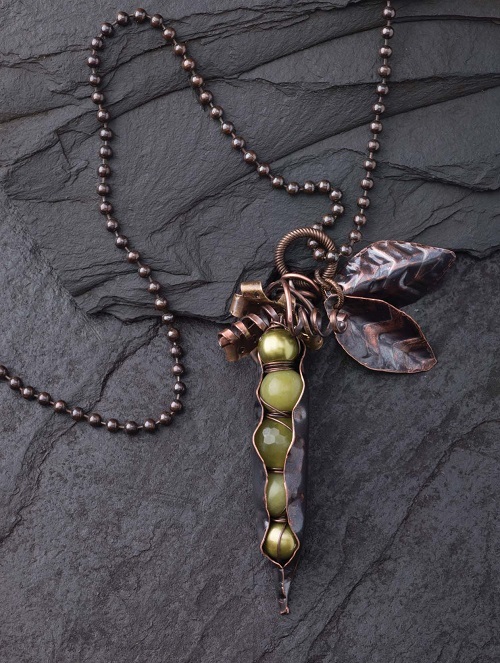 I would love to learn more about riveting in making jewelry - how to do it and what to use. Looks like a fantastic reference book. The creativity showcased in this book makes me want to stay up all night and try all the beautiful pieces shown! I would be over the moon to win this book!!! Thanks for the opportunity. Love metal and really love cold connections. Sometimes you just can't get to the solder station. Can't wait to see the boom. This book would be great to own. I love the new ideas. This book looks so cool. Love her work. Just tweeted again. I would love this book. I could learn much more about what I love doing. Thanks Pearl. Tracy's designs are absolutely gorgeous! It's amazing that she creates this beautiful and sophisticated jewelry without using a torch - especially those peas in the pod! I would love to learn her techniques. Thanks for introducing this book. Hi Pearl! Thanks for hosting another giveaway!! I would love to win Exploring Metal Jewelry. I've been interested in making metal jewelry for a while now and this would be a great help to get me started. I follow your blog. I'm a FB fan. I would love to win this book. Thanks for the chance!! I follow your blog through my email also. What can I say. It's a great blog. Would learn a lot with this book. Would love to win this book and read more of her tips and techniques. Hi Pearl, just tweeted about the giveaway! I have been out of jewelry for a little while due to differing circumstances. I love metal work and this book would be great to get me jumpstarted again. I'm inheriting a few bins full of wire and some tools from an old friend who's downsizing. A book like this would be so fabulous to get me started. So interesting! Thanks for the opportunity to win this great book! I love your blog and all the great posts. Would love to win this book. This is what I do! Love mixing metals, stones and beads. Thanks for the giveaway - there are many new ideas here I would love to try! Getting my hobby room all straightened out and ready to go. Would love to win this book to get me jumpstarted again. Looks like a fabulous book. I subscribe your blog. What a fantastic looking book, would love to have this resource!! !